Pat Lefemine, owner of Bowsite.com is once again hunting with his friend, and first class guide Wes Atkinson. Wes recently sold his outfitting business, Atkinson Expeditions, to Whitaker Brothers Hunting Company. WTB will carry on the same high class hunting that made Atkinson Expeditions a top name in quality western big game hunting. 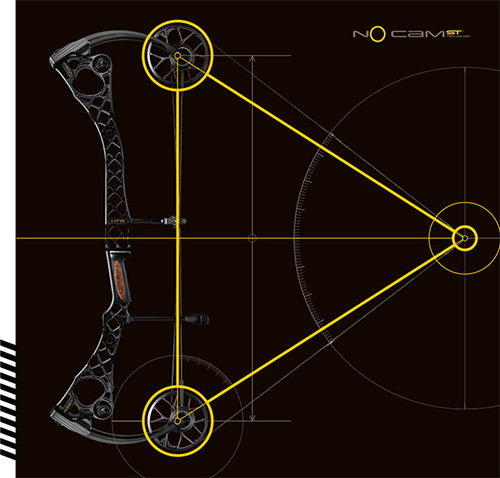 For those of you new to Bowsite let us give you a summary of the now infamous Bowsite.com Live Elk Hunts. 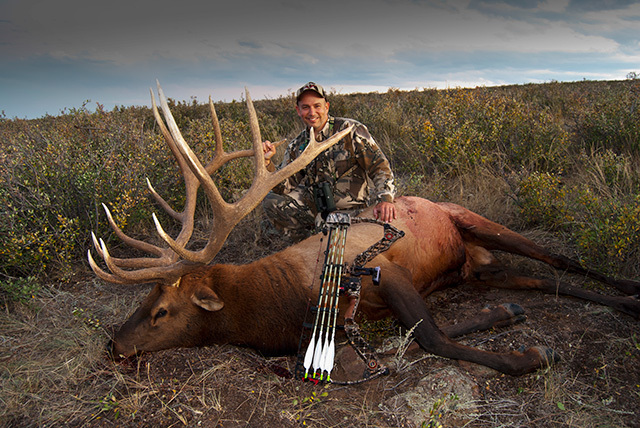 It took Pat Lefemine 14 elk hunts to kill a bull elk. It became both legendary and comical and was definately Pat's nemesis species. 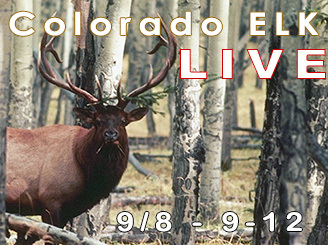 In September 2010 Wes guided Pat onto the bull of a lifetime and the Bowsite "Curse" was finally laid to rest with a giant bull elk shot on video, after a spot and stalk in the open Mahogany of Northeast Colorado. Our first day started last night with a quick scouting trip. We found bulls right away and put them to bed. This morning we were glassing the mountain long before sunrise and spotted two bulls, A mature freak bull with a deformed right beam and an immature 6x6. I actually liked the freak and while we decided not to try for him the very first morning, I'm keeping him in my back pocket. There are giants' here but my goal is to have a fun hunt and bring home a truckload of meat for Mrs. Lefemine. Since I have both a mule deer and elk tags Wes and I went to look for a mulie. We found three bucks but none of them were big enough for us to try for. We have a good plan for the afternoon and already things are looking good. The big herd is elsewhere right now but that could change any day. We were back on the mountain during the mid-afternoon. We knew there were bucks around we just needed to find them. 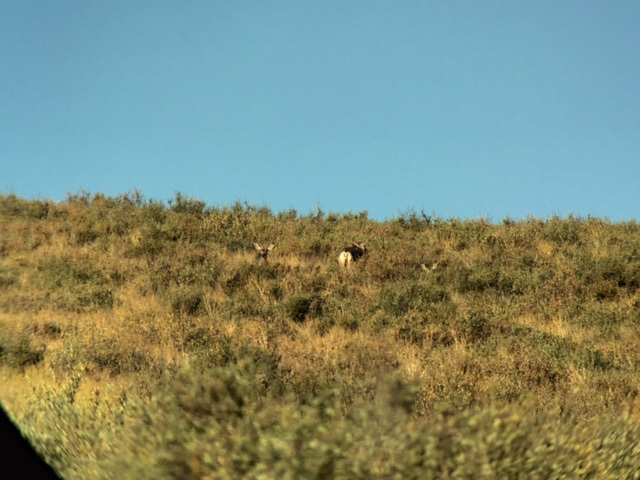 Wes and his crew are experts at finding deer and elk. I am pretty much useless compared to them. We spent a couple hours glassing from different angles. Wes decided to drive up to the top and glass from above. 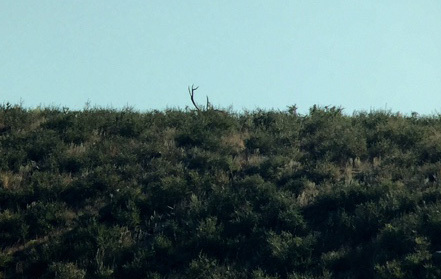 He spotted a really nice hard-horned muley bedded and the hunt was on. It was not very far away, maybe 500 yards, but it took us close to an hour to get down to them as we played the wind and terrain. As we got close, we found the deer - still bedded. But we caught a glimpse of yet another buck - a respectable 4x4 that was on his feet and feeding east of us. I told Wes I'd shoot him if he gave me a good shot. He started walking right at us. At one point it looked like I was going to get a shot but he never stopped, he walked briskly right by me at 40 yards and I never had a good angle or a stationary shot. He met up with the other buck and was now out of sight. 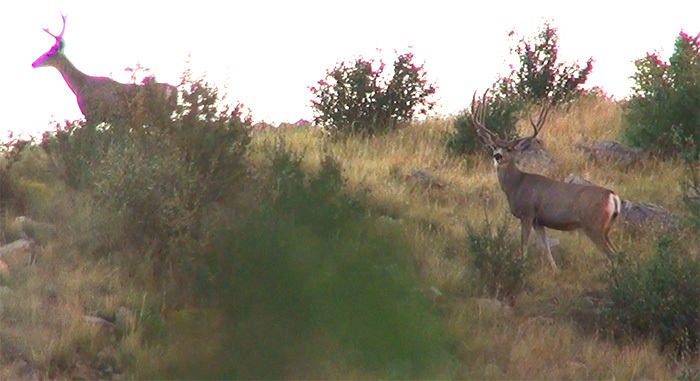 We started to make a move when Wes spotted two more bucks coming. They were dinks and at one point started to spar with each other. Our two big bucks were right around the corner of the knoll we were next to, no more than 50 yards. It was going to be a chip shot. The other two bucks followed the path of the 4x4 and headed right at us. One of them saw us and walked right up to me - literally 15 yards away. We were both frozen in place, but it didn't matter. He busted and blew the setup. So close! We walked back to the truck and stated down the mountain. The sun was just going down and the thermals were flowing down the hill. As we turned a corner We literally bumped into two more bucks and one of them was a very wide and deep-forked 3x4. They were used to ranch trucks so we just rolled on by and once we were out of site we got our gear together and moved quickly up the mountain to the draw they had dropped in. Wes motioned that they were right under us - 37 yards and feeding! It was going to be a slam-dunk. 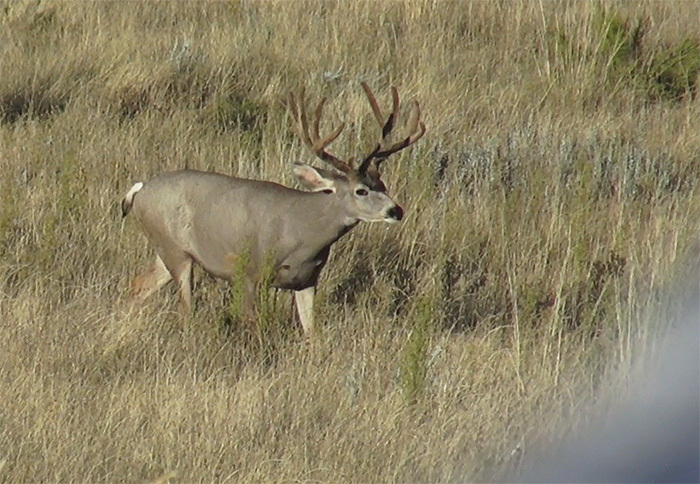 But just as we discussed the situation we both felt the wind hit our back and the muley's spooked. Wes thought he was a solid 160-170 framed buck. So we ended day 1 with two very close calls. We did everything right, we were just handed a curve by mother nature. That's hunting. 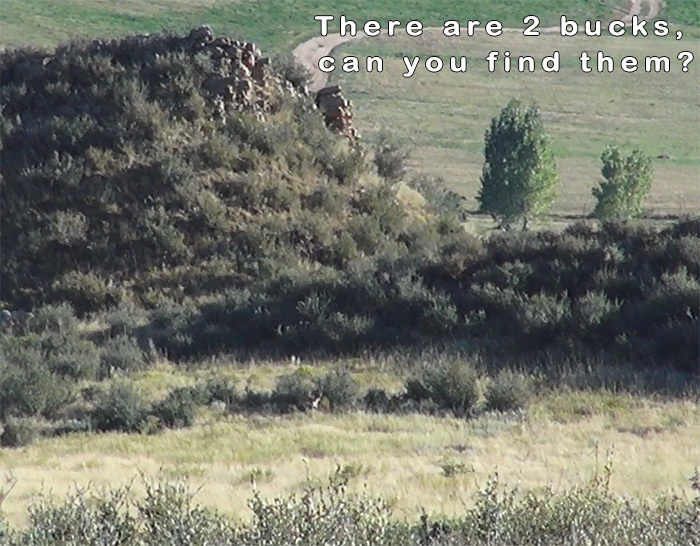 There are bulls and bucks all over the mountain. This is going to be fun! !